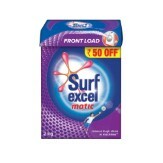 Amazon India offering Surf Excel Matic Front Load Detergent Powder - 2 kg Rs 330 only which is worth for Rs 450 at best and Cheapest price online. make cart value 499 Else (Rs. 40 Shipping charge) Or Free and Fast Shipping for Prime Users. Activate your prime account .You can follow the below steps to buy this product at their deal price.Keep Visiting dealsheaven.in for more Best offers ,hot online deals, promo code, coupons and discount . Created to work in high water levels of front load washing machines. Its hand rub action power ensures, no more soaking and scrubbing. It's low suds formula creates the right amount of foam that takes care of your expensive machine. Dissolves completely leaving no residue on clothes or in your machines. How to buy Surf Excel Matic Front Load Detergent Powder - 2 kg?